Creative Mountain Games: Events & Play Wednesday - Gen Con Indy & Gary Gygax Day! Events & Play Wednesday - Gen Con Indy & Gary Gygax Day! If you haven't already made plans to go to Gen Con this year, you are fast running out of time. It takes place July 30 - August 2, 2015 and will likely top 60K attendees. For me, the main deterrent are the crowds. Not that I don't enjoy being around a lot of gamers. It's just that my picture-taking compulsion would make it impossible for me to get in any gaming! While we're on the subject of Gen Con, and future Gen Cons, here's a screencap of their page where all the future Gen Cons through 2020 are stored. It's not a secret chamber not are there any locks or traps, except perhaps the allure of going to one of them. Save versus Fun! 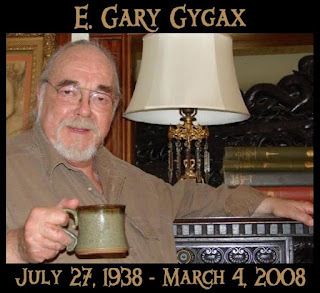 Finally, make your tabletop gaming plans for Gary Gygax Day for Monday, July 27th, that being the date of his birth. Perhaps on the weekend leading up to it? It's less than two weeks away, so don't waste another moment! If you can manage to run (O)D&D or 1E AD&D you'll be honoring him doubly so but any roleplaying game would be his wish, or even a wargame or some Ticket to Ride: Europe (which he enjoyed quite a bit in his later years). Just try to get a game or two into your schedule and take a moment at some stage to think of all that Gary Gygax did for hobby gaming! You can kep an eye on what others are doing through the Gary Gygax Day Facebook page here.